On August 30, 2004, astronomers discovered a planet 40 light years away orbiting a sun-like star. The planet, named 55 Cancri e has half the mass of Neptune, almost 8 times more of the Earth. 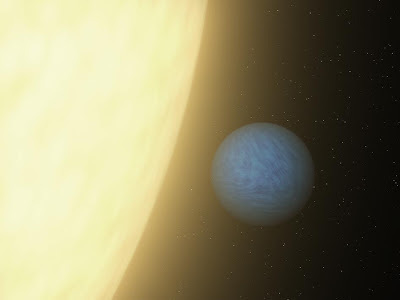 It is twice the width of the Earth classifying it as the first discovered Super-Earth. 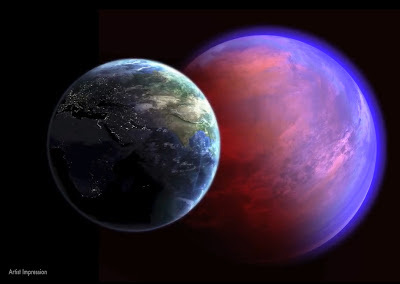 Super Earth planets are more massive than the Earth but lighter than gas giants like Neptune. They can be made up of gas, rock or both. To date, there are around 70 discovered super-earth like planets with hundreds more waiting to be classified. The planet, 55 Cancri e, orbits the star 55 Cancri A. It is the innermost planet in its planetary system, orbiting 55 Cancri A twenty-six times closer than that of Mercury to the Sun. It takes the planet eighteen hours for it to orbit the star. Because of the proximity of 55 Cancri e to 55 Cancri A, temperatures of the planet when facing the star reaches more than 2,000 Kelvin or 3,140 Fahrenheit. This is hot enough to melt metal. Several theories abound on the composition of the planet. An observation by the Spitzer Space Telescope suggests that 20% of the planet may be comprised of light elements and compounds, including water. They believe that the water exists in both liquid and gas called a supercritical state. And that the whole planet is blanketed by steam. Since hydrogen has yet to be observed from the planet, it could be that instead of water, the compound could be made up of carbon dioxide. "This is our first glimpse of a rocky world with a fundamentally different chemistry from Earth," said lead researcher Nikku Madhusudhan, a Yale postdoctoral researcher in physics and astronomy. "The surface of this planet is likely covered in graphite and diamond rather than water and granite." The planet — called 55 Cancri e — has a radius twice Earth's, and a mass eight times greater, making it a "super-Earth." It is one of five planets orbiting a sun-like star, 55 Cancri, that is located 40 light years from Earth yet visible to the naked eye in the constellation of Cancer. The planet orbits at hyper speed — its year lasts just 18 hours, in contrast to Earth's 365 days. It is also blazingly hot, with a temperature of about 3,900 degrees Fahrenheit, researchers said, a far cry from a habitable world. The planet was first observed transiting its star last year, allowing astronomers to measure its radius for the first time. This new information, combined with the most recent estimate of its mass, allowed Madhusudhan and colleagues to infer its chemical composition using models of its interior and computing all possible combinations of elements and compounds that would yield those specific characteristics. Astronomers had previously reported that the host star has more carbon than oxygen, and Madhusudhan and colleagues confirmed that substantial amounts of carbon and silicon carbide, and a negligible amount of water ice, were available during the planet's formation. Astronomers also thought 55 Cancri e contained a substantial amount of super-heated water, based on the assumption that its chemical makeup was similar to Earth's, Madhusudhan said. But the new research suggests the planet has no water at all, and appears to be composed primarily of carbon (as graphite and diamond), iron, silicon carbide, and, possibly, some silicates. The study estimates that at least a third of the planet's mass — the equivalent of about three Earth masses — could be diamond. "By contrast, Earth's interior is rich in oxygen, but extremely poor in carbon — less than a part in thousand by mass," says co-author and Yale geophysicist Kanani Lee. The identification of a carbon-rich super-Earth means that distant rocky planets can no longer be assumed to have chemical constituents, interiors, atmospheres, or biologies similar to those of Earth, Madhusudhan said. The discovery also opens new avenues for the study of geochemistry and geophysical processes in Earth-sized alien planets. A carbon-rich composition could influence the planet's thermal evolution and plate tectonics, for example, with implications for volcanism, seismic activity, and mountain formation. "Stars are simple — given a star's mass and age, you know its basic structure and history," said David Spergel, professor of astronomy and chair of astrophysical sciences at Princeton University, who is not a co-author of the study. "Planets are much more complex. This 'diamond-rich super-Earth' is likely just one example of the rich sets of discoveries that await us as we begin to explore planets around nearby stars." In 2011, Madhusudhan led the first discovery of a carbon-rich atmosphere in a distant gas giant planet, opening the possibility of long-theorized carbon-rich rocky planets (or "diamond planets"). The new research represents the first time that astronomers have identified a likely diamond planet around a sun-like star and specified its chemical make-up. Follow-up observations of the planet's atmosphere and additional estimates of the stellar composition would strengthen the findings about the planet's chemical composition. A Possible Carbon-rich Interior in Super-Earth 55 Cancri e.